Keep the kids happy with a waffle bar. 1 What Is Good Food to Serve for a Kid's Birthday Party? Late-morning meals that often take place on the weekends, brunches typically replace breakfast and lunch and feature both classic breakfast and lunch food items. Brunches can be formal or informal occasions and are frequently used for bridal and baby showers. If you are planning a brunch for your friends and family, decide the type of event you want to have before you buy supplies or groceries. Choose a brunch theme. If you are planning a family brunch for Mother's Day, a friend's baby shower or a sister's birthday, use the special occasion as your theme. For these types of brunches, you may serve a cake or the honored person's favorite foods. If you are throwing a brunch just to get friends and family together, choose from many other types of themes depending on the formality of the event. For example, for casual, informal get-togethers, you can have a Mexican or American brunch that feature classic foods from these areas. If you are planning a formal brunch, use a French theme or a garden party theme that features champagne brunch. Think about how you plan to serve your guests depending on your brunch venue. Choose between a buffet-style serving situation and a seated arrangement. Consider how much room you have in your dining room (or rented party space), as well as how many guests you'll have. If you plan on having a buffet-style brunch with several hot plates, make sure you have the proper heating plates and equipment to keep the food at safe temperatures. Plan your dishes around your number of guests. Unless you can afford to cater your brunch, prepare to make the dishes yourself. Choose your brunch items wisely, or you'll be so busy cooking, you won't be able to enjoy your own party. Some items that are easy to make ahead of time and serve to large groups include breakfast casseroles, pancakes, quiches, scrambled eggs, waffles, French toast and fruit. A large buffet-style brunch could also feature a breakfast taco bar, where guests make their own plates out of many different ingredients, such as scrambled eggs, bacon, potatoes and cheese. Provide a selection of taco toppings such as salsa, guacamole and ranch dip. 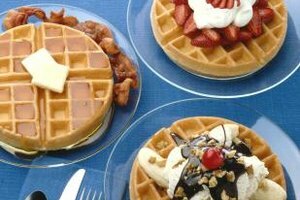 Or, opt for a kid-friendly waffle bar, with a selection of fruits, nuts and syrups. If you are hosting a small, intimate gathering, serve more elaborate omelets, eggs Benedict or shrimp and grits. Offer guests a wide variety of brunch beverages. Be sure to include coffee, tea, water, milk and variety of juices. If you guests enjoy imbibing in alcoholic beverages, you can make a pitcher of mimosas (champagne and orange juice) or even set up a Bloody Mary bar.